Located where the Potomac River and the Wicomico River meet, Cobb Island real estate is a unique and charming residential island in Charles County, which prides itself on being set apart from the hustle and bustle of city life. Still, it’s nice to know that if you get the itch to spend time in the big city, Washington D.C. is a mere sixty miles north, while Baltimore is only 86 miles away. Whether you are looking to buy a home on Cobb Island, or for a vacation home to rent, you can be sure that your time spent on Cobb Island will be rewarded with beautiful sunsets, soft beaches, bountiful seafood, the peace and quiet of communing with nature, and the feeling that you belong to this one-of-a-kind community. It goes without saying that buying a Cobb Island home means having access to some of the best seafood in the country. Perhaps the most famous Cobb Island haunt is Captain John’s Crabhouse, which has been serving up some of the region’s best seafood for forty-seven years. People travel many miles from all over to enjoy a meal here. While the Cobb Island Market provides many everyday staples, there are also plenty of stores and restaurants off island, just on the other side of the Wicomico in St. Mary’s County, or on the mainland on the other side of Neale Sound. Whether you like to fish, sail, or simply sunbathe, Cobb Island residents, both full and part-time, enjoy a variety of “island” activities on a daily basis that most people only dream of. Can you imagine a horizon uninterrupted by skyscrapers, the quiet lapping of waves on clean, sandy beaches, and a day spent exploring the still-pristine natural beauty of a place where people boat more than they drive? 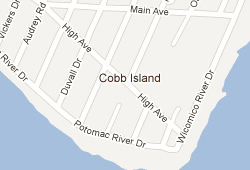 Then consider the magnificent real estate of Cobb Island, where paradise is just another word for home. Celebrating this special place is the Cobb Island Day Festival, which happens every June, complete with a parade, games, performances, live music, and of course, great food. When buying Cobb Island real estate, it's imperative to understand the word neighbor actually means being able to trust that you can refrain from locking your door, that if you need help moving something heavy, you just have to ask, and that if you host a barbecue, people will bring their favorite dish to contribute. Much of what makes Cobb Island special is the idea that, as a small community with a population just over 1,000, everyone’s contribution counts. What makes Cobb Island real estate so special, apart from the scenic wonder of the place, is this pride in being small in number, but big in heart. The Cobb Island Citizens Association (CICA), plays an integral part in maintaining this community spirit, keeping residents included and informed of decisions that effect them. Cobb Island’s children attend Dr. Thomas L. Higdon Elementary School and Piccowaxen Middle School in Newburg, and La Plata High School in La Plata. These schools are all part of the Charles County Public Schools System, and school bus transportation is available. The closest hospital to Cobb Island is the Civista Medical Center in La Plata, which is about a half-hour away. Civista has been ranked amongst the top-ten best quality hospitals in the state, providing premium services that include emergency care, obstetrics, joint replacement, and surgery. While many resident’s favorite mode of transportation on Cobb Island is a boat, Cobb island also benefits from a very walkable layout, as well as easy access to the mainland and major highways, via the Cobb Island Rd. bridge, which crosses the Neale Sound to connect with the mainland.